That's how many new delivery vans Amazon has ordered, up from an initial order it had placed for 4500 vehicles. What caused the major order bump to Mercedes-Benz, which is making the light trucks? Higher than expected interest in Amazon's new Delivery Service Partners program — designed to let entrepreneurs run their own local delivery networks of up to 40 vans emblazoned with Prime logos. This of course will give Amazon a direct delivery network to reduce its dependence on UPS, FedEx and the USPS, though it continues to claim it has little interest in building such a capability. Sure. "We have been blown away," by the interest, said Dave Clark, Amazon's senior vice president of worldwide operations. He also said that tens of thousands have applied for the program	, but declined to give a specific number. Clark added that some of the vans are already on the road, and he expects thousands of the vans to be delivering packages by the end of the year. The full order of 20,000 vans should be on the road in the next year. That apparently is the base price for a new 3D printer from HP that will be able to produce objects made of metal, such as stainless steel, versus the plastic-based products HP printers could use before. This of course opens up a wide range of new product opportunities, such as auto parts, with auto supplier GKN saying that it will use the new Metal Jet printers to produce a select group of lower volume parts for Volkswagen, with plan for expansion. HP unveiled the printer this week at the International Manufacturing Technology show in Chicago. 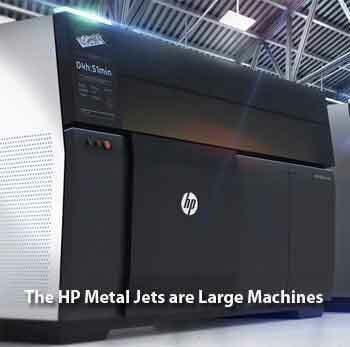 Of course, HP is not the first with a metals-capable 3D printer, with competitors such as 3D Systems and Stratasys already in the game. But HP claims but the Metal Jet can produce a lot more parts at "significantly" lower cost than existing machines. HP says it is focusing on "mass production of parts,” not just low volume SKUs that have to date been the focus on 3D printers. In fact, it plans to offer its own 3D manufacturing service using the printers. However, HP says the Metal Jet will not even be "broadly available" until 2021 – you can pre-order a Metal Jet today if you've got the 400,000 bucks. That would be the rise in steel worker wages in the first year of a new six-year contract that is being offered by US Steel, as negotiations with the union carry on after the current contract expired on Sept. 1. The US steel contract offer also would provide 3% hikes in each of the next two years. Annual raises would drop to 1% in the last three years, with the addition of new bonuses pegged to pretax profit. The lowest annual base wage, excluding profit-sharing and other variable pay, would rise to $71,726 in 2024 from $63,516 this year. But union leaders want more, after US steel workers saw zero increases in the past few years due to tough times in the steel patch. Now, times for steel makers are good, the result of a strong economy and the US tariffs on imported steel. The price of steel in the US has risen by more than 30% this year, while US Steel has forecast a more-than-60% increase in adjusted pretax income for 2018. All told, some 30,000 steel workers are affected in the negotiations between the unions and US Steel and also global giant ArcelorMittal. Keep an eye on this one. That's how much a driver for Walmart's private fleet can earn in a year, along with 21 paid vacation days. Wow, that seems pretty good, right, especially as the lifestyle of Walmart drivers is generally much better than long haul drivers generally? Doesn't matter, it's apparently not enough in this era. Walmart said this week that it plans to double its spending on attracting and retaining drivers by year-end. "To be candid, right now I could hire a few hundred drivers,” Tracy Rosser, Walmart's senior vice president of transportation, said this week. "It is getting tougher and tougher to find qualified drivers. It's a really serious situation right now.” Walmart currently has about 7500 in-house drivers. The additional recruiting spend includes referral bonuses of up to $1,500, shortening the on-boarding process for new hires by more than a month, and broadcast of its first national TV ad focused on its drivers. Driver turnover is low – about 7% in recent years – but trending higher, Rosser said.